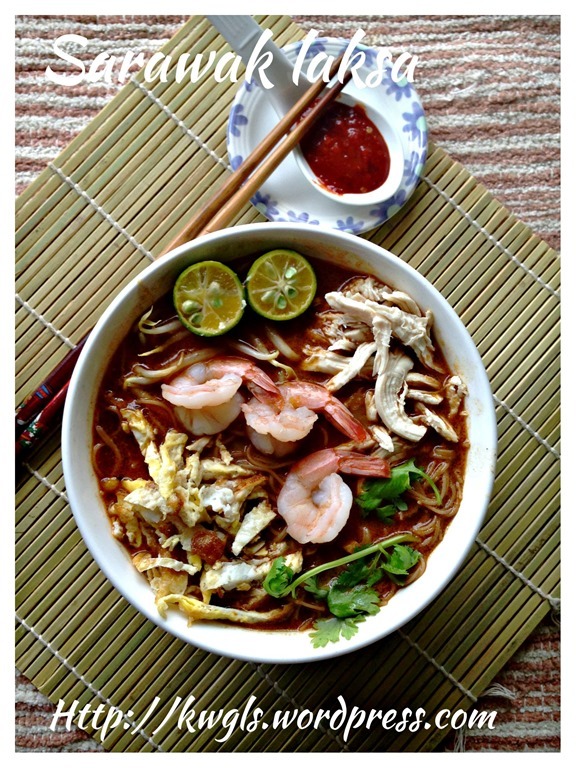 Part I and Part II are rather “theoretical” and this post will show you the practical steps to prepare the Sarawak laksa. 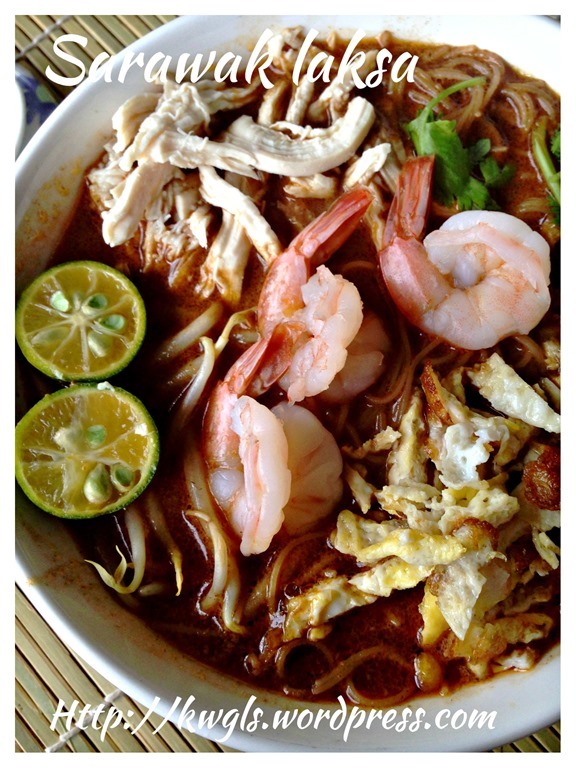 To make a delicious bowl of Sarawak Laksa, besides having some good laksa paste that I mentioned in Part II, there are few important things that you should note in your course of preparation. The process of preparation is rather laborious and I will list out the steps and unlike other posts, you should consider follow the order of steps here to save your time of preparation.. 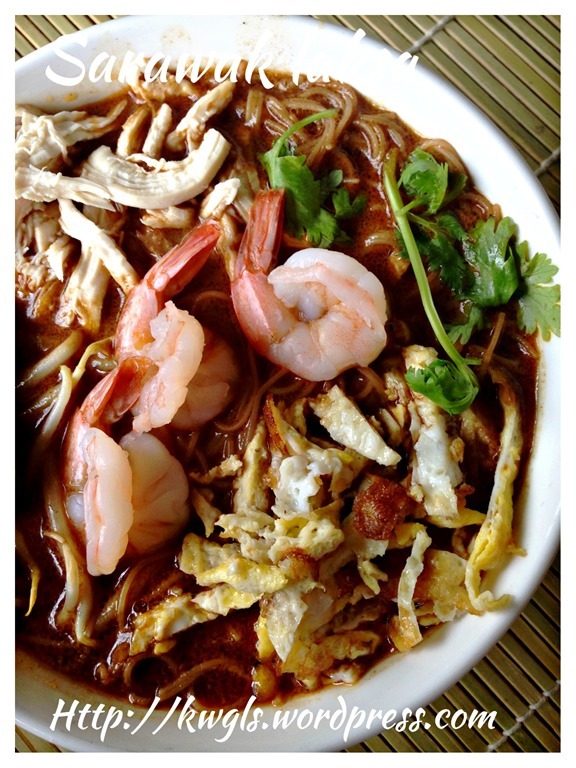 In this post, the units or quantities listed out here is for about 15 bowls of laksa and you should reduce it accordingly after taking into considerations the number of persons and personal preferences. For coconut milk, you can use fresh or packet coconut milk. If you like it more milky (lemak), you can add in more coconut milk. If you are health conscious, either substitute it with evaporated milk or don’t add any milk at all. Have you ever heard that this delicacy is a “cardiologists nightmare”? 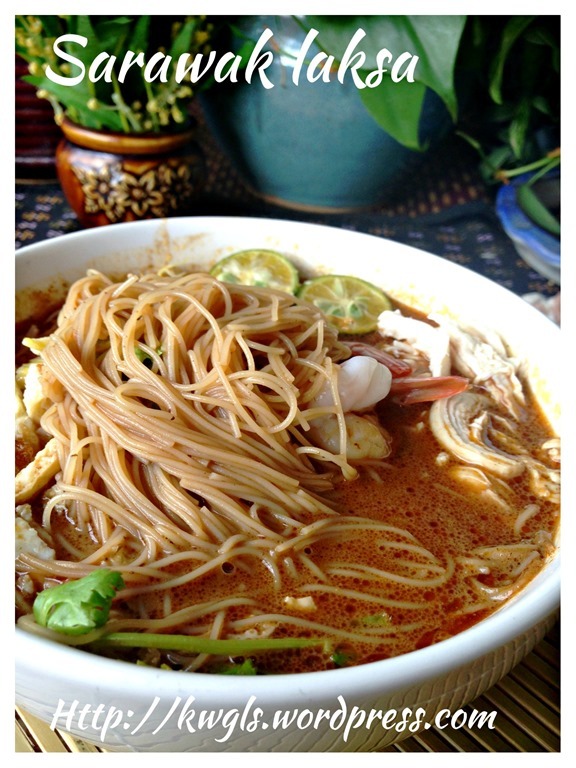 Do you know that to qualify a dish as laksa, the noodles must be either thick or thin rice vermicelli in it? Curry Mee is not a laksa as per definition of laksa here. At home, we do eat it with instant egg noodles ..
One of the most important condiments in this dish is Sambal Belachan, a type of condiments made from shrimp paste. You can know more about belachan here. 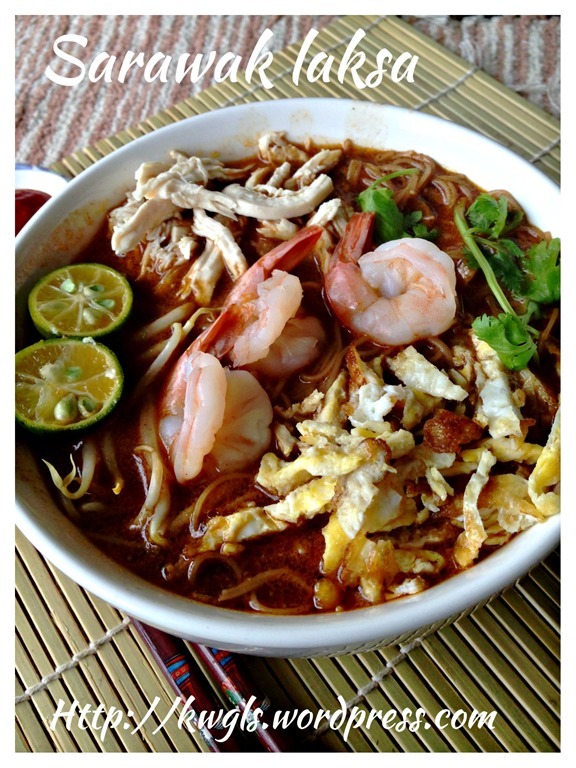 That is why sometime Sarawak Laksa is called Sarawak Sambal Laksa. I have buy the over-the-counter sambal belachan in Singapore and the taste just blends especially well with the soup. If you have kids at home and they do not take spicy food, actually, when making the Laksa Paste, you can ignored chilli as an ingredients. So the laksa broth or soup that you cooked will not be spicy and you can let your kids have this. When you are eating on your own, just have one big scope of Sambal Belachan in it, the taste will be similar with those paste that have chilli in it.. The coriander leaves that you see in my picture is the type sold in Singapore and West Malaysia. Traditionally, in Kuching, Sarawak, coriander “seedlings” were used. However, it is harder to get it nowadays. In my old days, as one of my brothers do not like the strong smells of coriander leaves, we use Chinese celery instead. Until today, I still have the habit of mixing these two leaves as a garnish for the laksa. If you don’t want to add seasonings like “axinomoxo”, then try to follow these steps as it will save you time and seasonings! Joking. 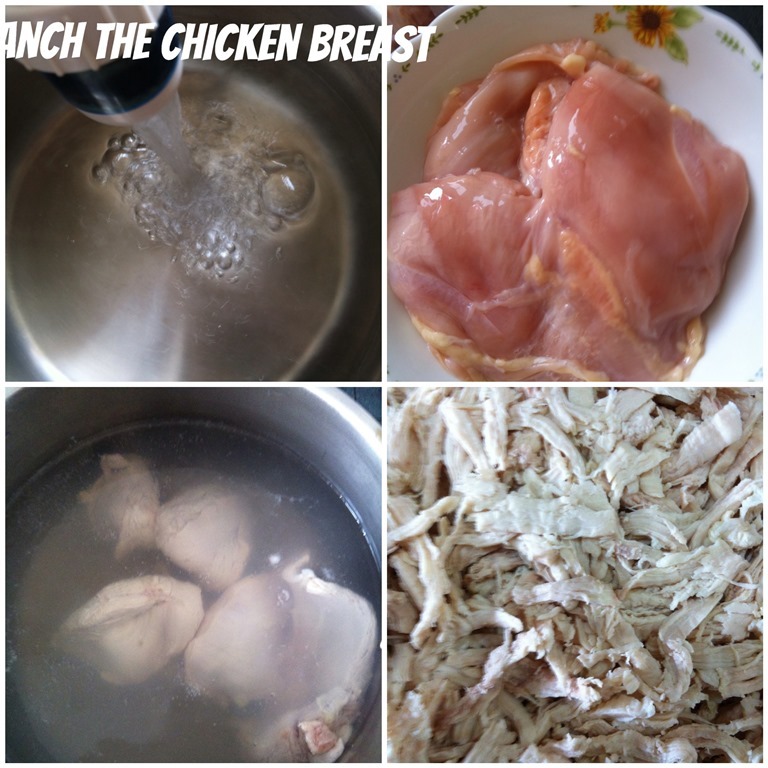 Clean your chicken breast, boil your water and put in the chicken breast. The minimum amount of water required will be at least to cover the chicken breast. But you can use more water as it will be used later. Use medium heat and boil for about 20 minutes until cooked. Don’t cook too long because you breast will be juicy as all the juice will be in the soup. Traditionally, in Kuching, chicken breasts were used because it is easier to hand shred and with less bones. However, you can also use the whole chicken. If this is the case, you have to use high heat to bring the water to boil, submerged your chicken and simmer for 30 minutes. Once cooked, dip in ice cold water. You can refer to my post on chicken rice here. Hand shred your chicken breast and set aside for use. Remember to keep your “chicken stock” for future use. Clean the prawns. Blanch the prawns with the chicken stocks in Step 1. Personally, I prefer to blanch the prawns with shells at it will keep all the juices. 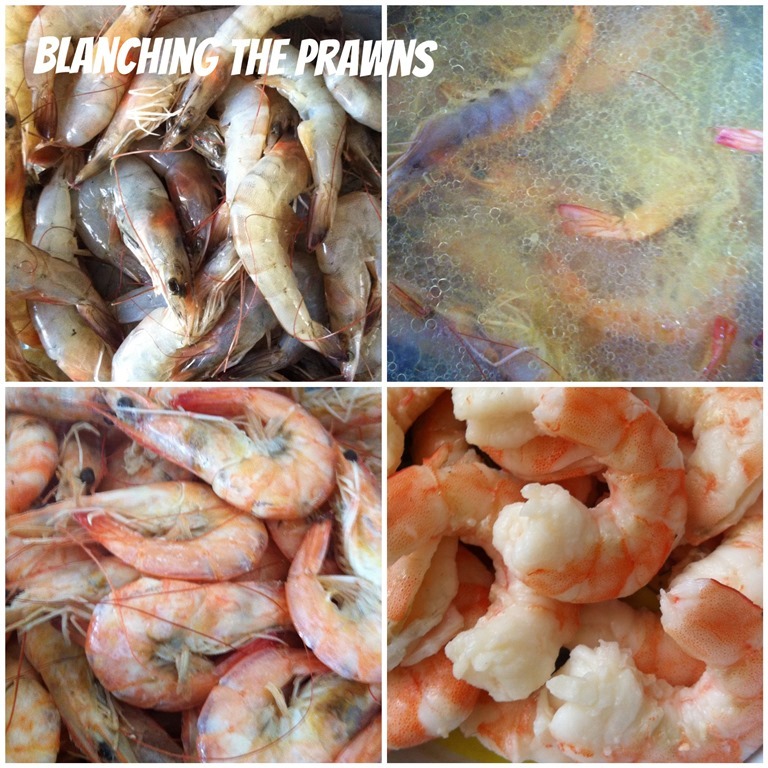 If you shell the prawns, the blanch prawns will be less tasty. This process will take only about 5 minutes. Sieve the prawns and set aside the “prawns and chicken stock”. As long as the prawns are cool, shelled the prawns and devein it. If you found that the prawns are dirty after you devein it, use some cooked water to clean it. DON’T THROW AWAY THE SHELL, keep it for next use. 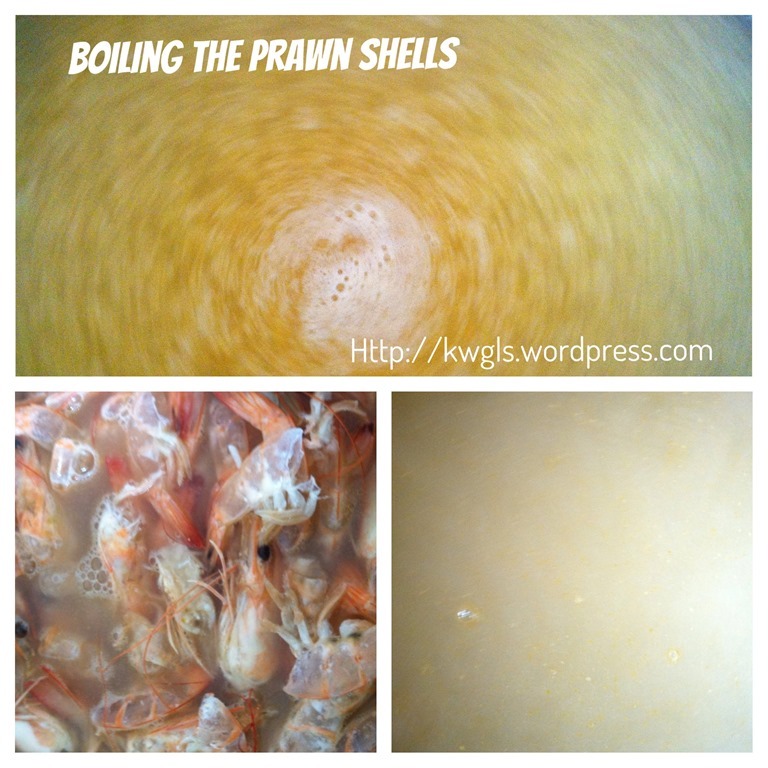 In another pot, put in some more water and boil the prawn shells until the colour starts to turn whitish. If you don’t need that much of soup, continue using the stock from Step 2 to cook the prawn shells. 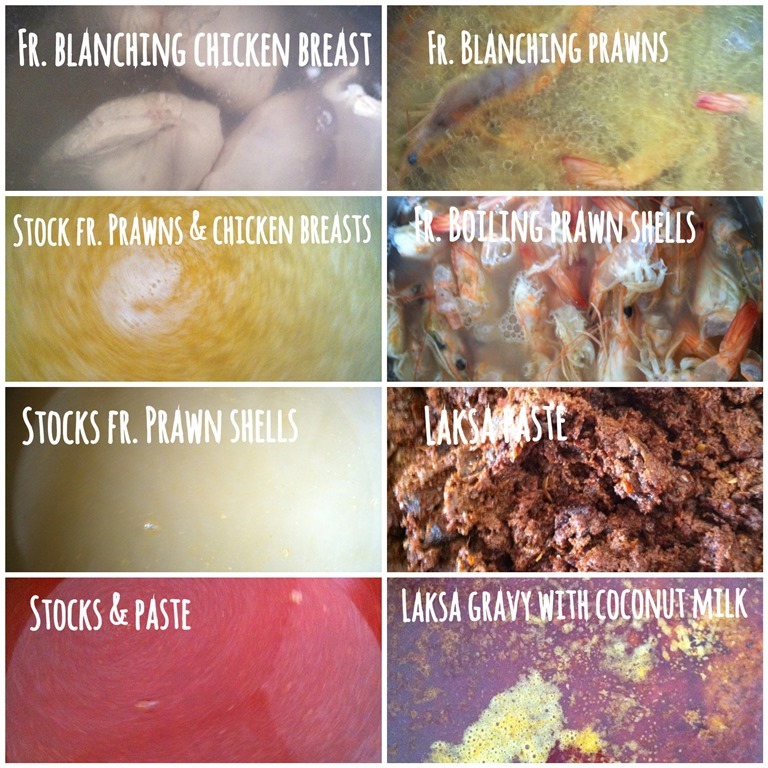 The stock in the first picture is the prawn + chicken stock as mentioned in Step 2 (from blanching of chicken breast and the fresh prawns). Look at the colour of the stock, the milky colour means that the soup is very concentrated and you can just take a spoon and taste it. It will be very delicious. 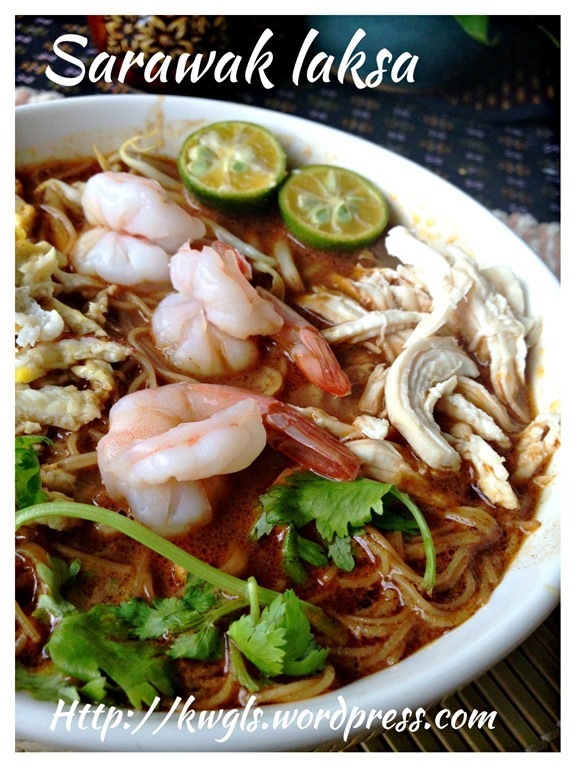 A side note, if you are not cooking Sarawak Laksa, when you shelled the prawns, just keep it in the fridge until a sizeable amount, then use this step to cook the prawn stock, then you can use this stock to cook the Hokkien Prawn Mee or Penang Prawn Mee! If you are concerned about the chicken oil and if you have time. Put in the fridge and let the oil solidify, just throw the oil away. Put the home made laksa paste into the stock from Step 2 and 3. Bring to boil, add in coconut milk and other condiments. Off the fire immediately when it start to boil again. Otherwise, the coconut milk will turn into coconut oil and your laksa broth will be spoilt. Remember that if you are afraid of having high cholesterol, use evaporated milk instead. How much coconut milk to add is very much depends on your personal preference. 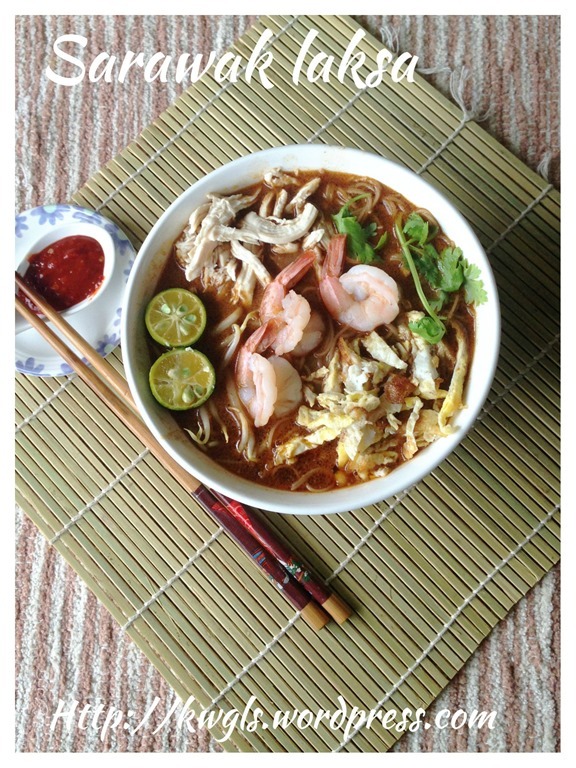 I remember when I was young, my parents sometime cook laksa without coconut milk…. Besides adding salt as a condiments, I have the habit of putting fish sauce instead. Note that the colour of my laksa broth is very bright because I use only fresh red chilli. If I used dry chilli, the colour will be darker. Cooking laksa will definitely yields quite a lot of oils. Just scope it away before you use the broth. Like chicken stock, you can put in the fridge for 2-3 hours, let the red oil solidify and throw that away. Heat up and serve. In that case your stock will look quite dull (brownish in colour). Break the eggs, put a few drops of cooking oil, use fork or chop stick to slightly beat it until all the yolks and the whites are completely mixed. Have a hot pan, pour some egg mixture into the pan. Either use a spatula to spread them evenly. You can also do this by twisting your pan slight in a circular motion. 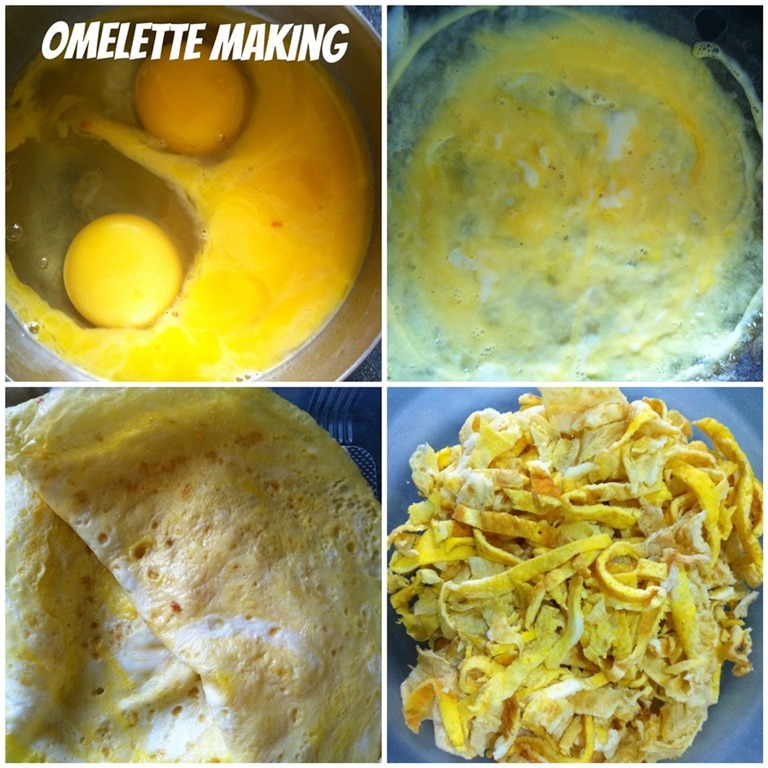 As soon as the egg mixture is firm in the bottom and you can smell the fragrance of fried eggs, just scope up the omelettes, let it cool and shred in fine long pieces. Note that if you are using a non stick frying pan, there is no need for you to use oil for frying as long as your pan is very clean and free from any food particles. You can also add a few drops of oil to the egg mixture before you pan fried them. In a frying pan, fill in some water and drip a few drops of cooking oil. Bring to boil, blanch the bean sprouts (approximately 5 minutes). Sieve the bean sprouts, set aside for later use. 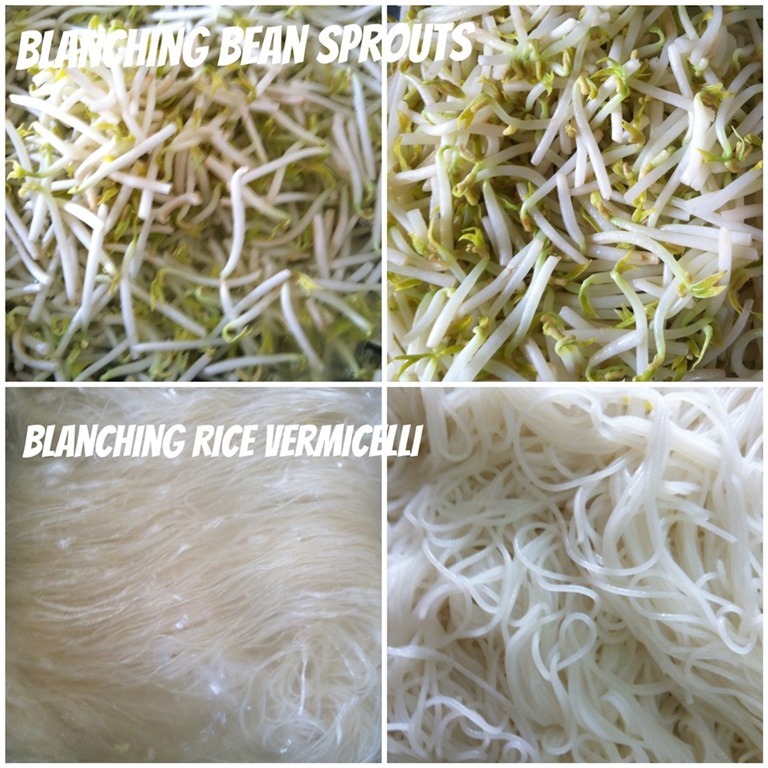 Use the same water to blanch the rice vermicelli. That will take about 10-15 minutes depending how soft you want it to be. 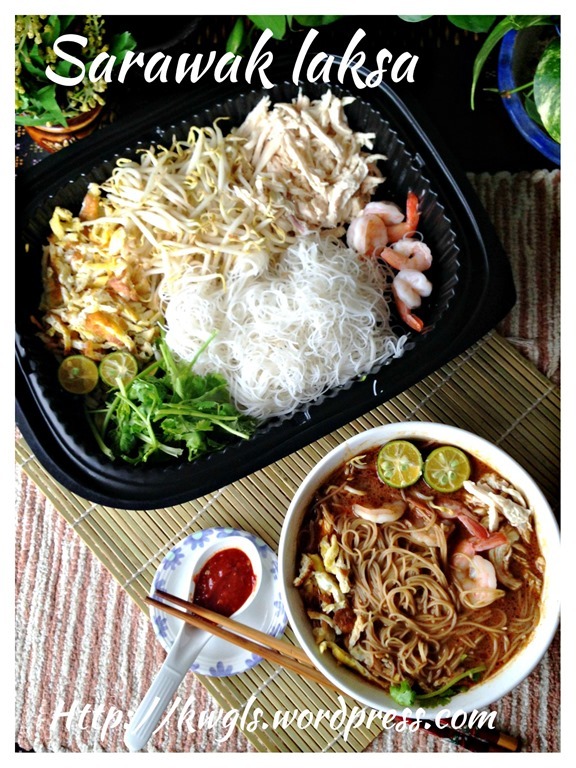 The process can be shortened if you have soaked the uncooked rice vermicelli before hand. Once you sieved the rice vermicelli, quickly put it under running tap water (or if you don’t like to drink from tap water, use some cold boiled water) for about 2 minutes.The purpose of this step is to ensure that you have some springy rice vermicelli instead of soggy rice vermicelli that stick together. The few drops of oil also have the role of ensuring that the rice vermicelli would not stick together. In addition, that small amount of oil will help you to “preserve” the colour of your bean sprouts. It will look fresher instead of cook. If you cannot stand the tails of the bean sprouts, you can hand picked the tails before you blanched them. For me, I usually hand picked the tails but when I run of times, I will just eat with the tails!! This step is best carry out before you serve the guest. After a few hours of ordeal, you should start to “regret” making this dish! 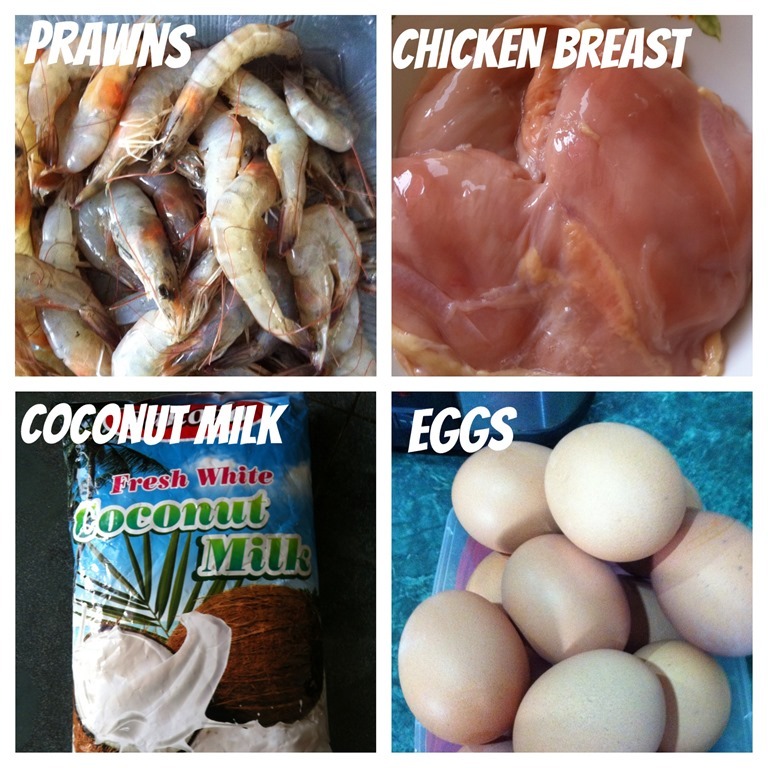 Lets have a quick recap of all the ingredients before serving. 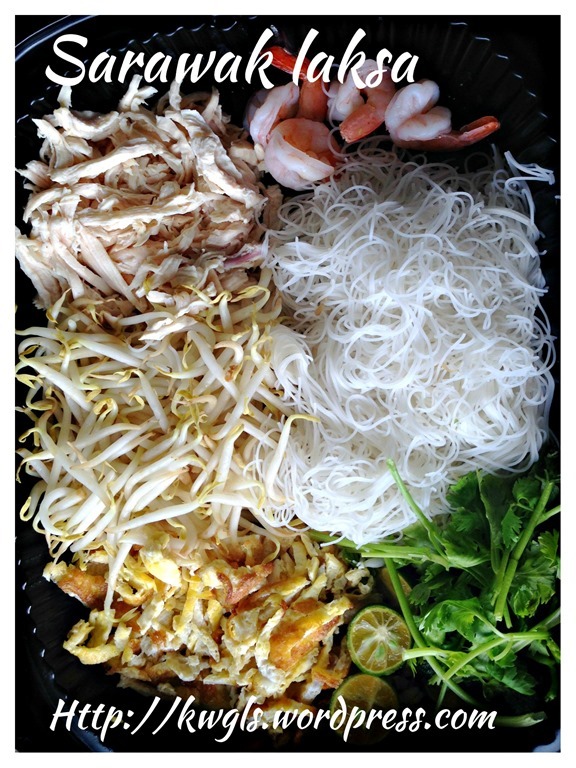 You should have blanched rice vermicelli, blanched bean sprouts, chopped coriander leaves and Chinese celery, cooked Sarawak Laksa broth, blanched prawns, shredded chicken breasts, stripped egg omelettes, calamansi and sambal belachan. 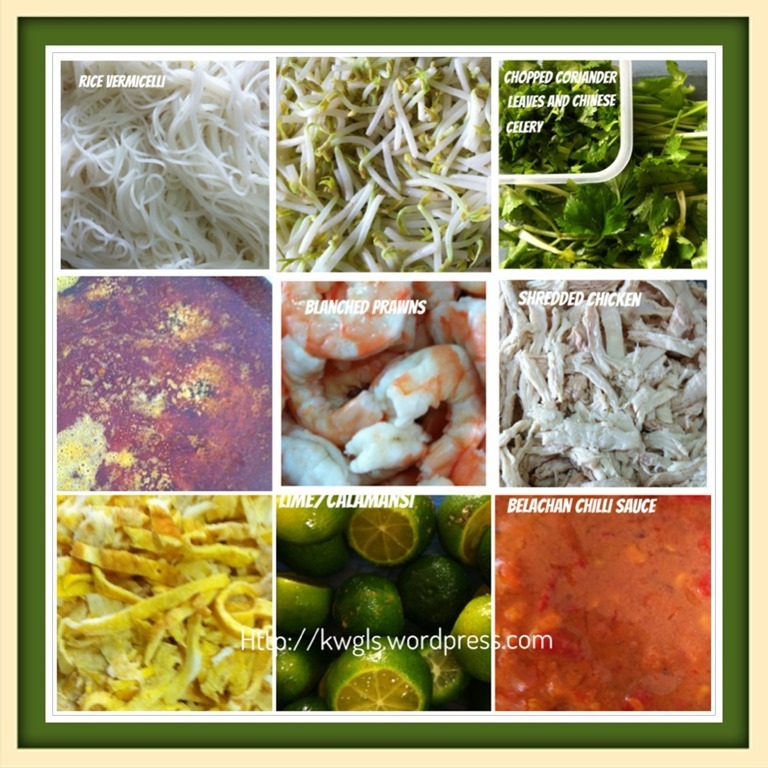 Take a bowl and assemble the ingredients following the sequence as in the picture (from left to right then to second row…) This, I believe will be the best presentation of your Laksa Sarawak. While the rice vermicelli have submerge in the soup, your prawns and the colour egg stripes are sitting happily on top of you reddish gravy, Do you think it is appetizing. 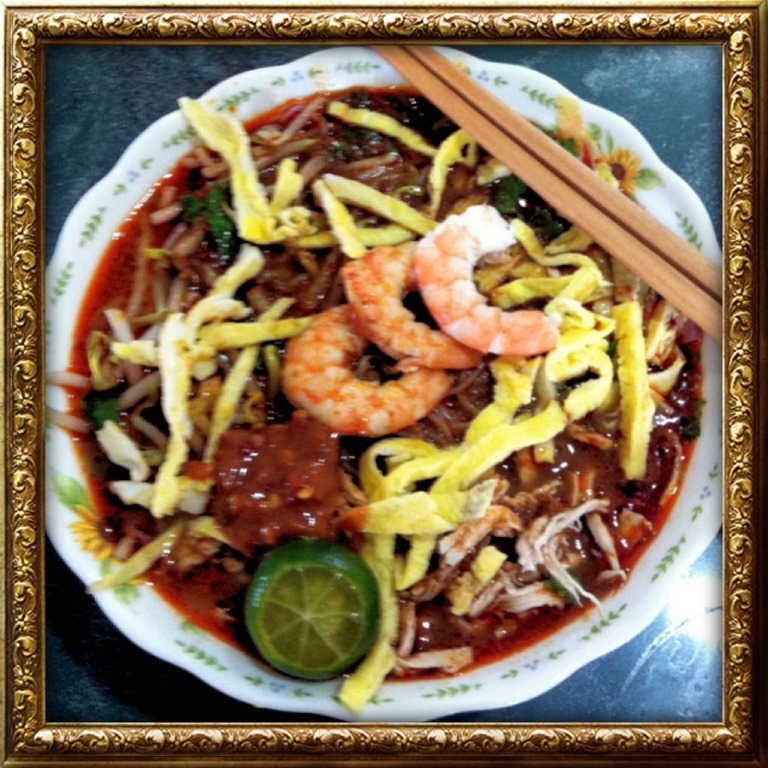 In Part 1, the definition of Sarawak Laksa, its uniqueness and the popularity have been discussed HERE. 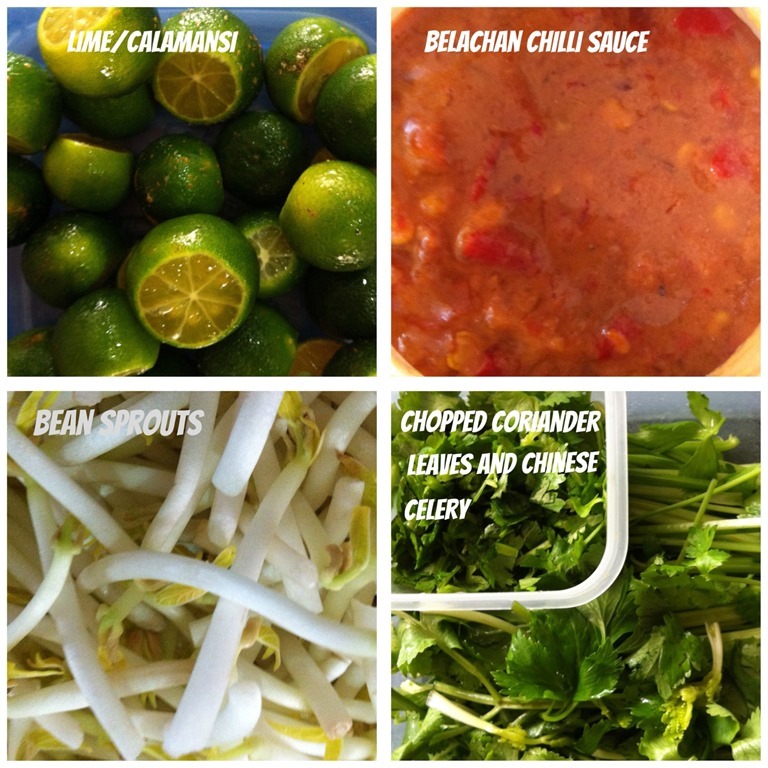 Part 2 dwelled into the details of making the Sarawak Laksa Paste with a list of all major raw ingredients, its procedures and a comparison analysis between recipes. Please refer HERE. 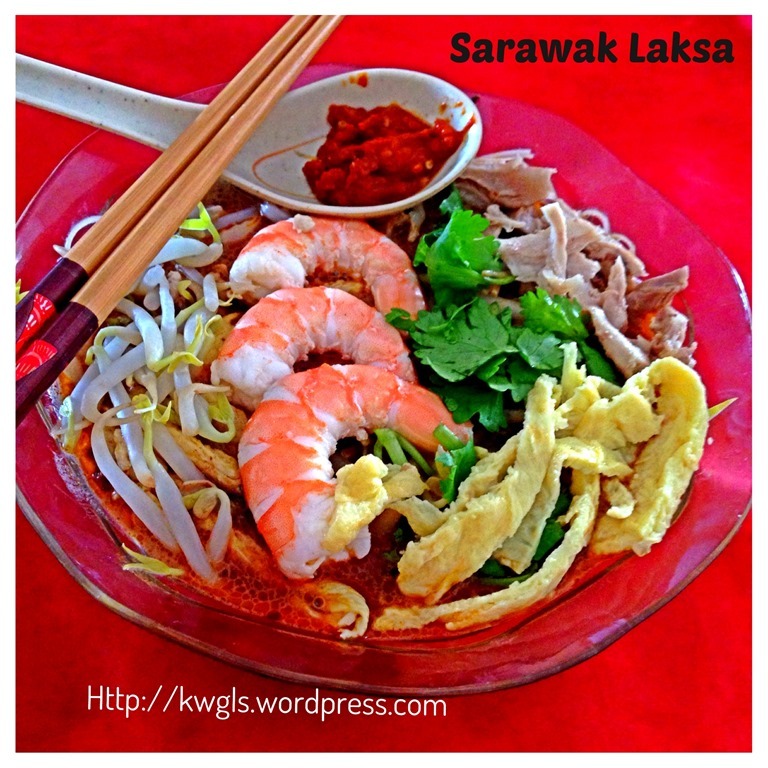 Part 3 detailed how Sarawak Laksa should be prepared. 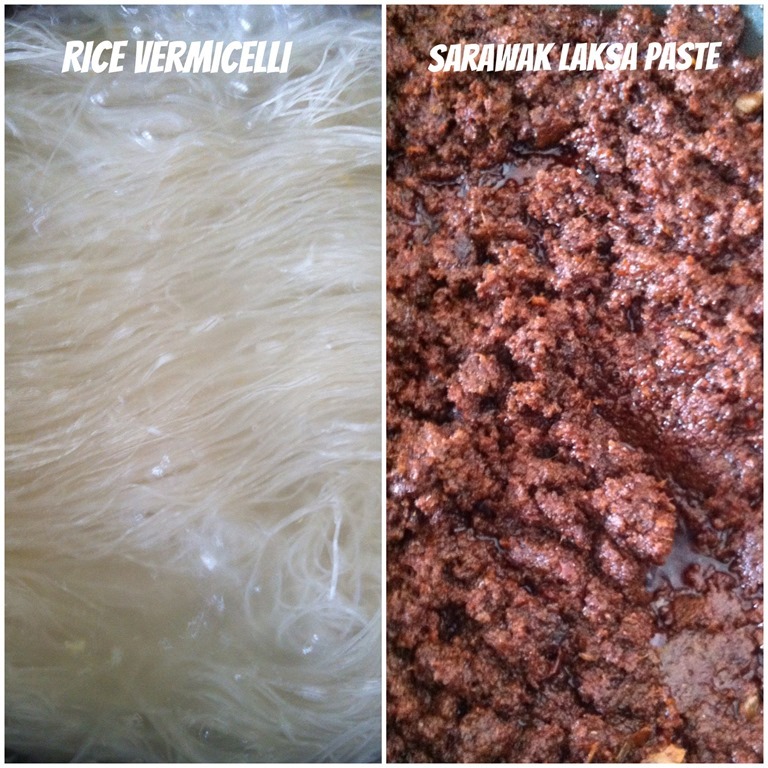 Hopefully, this will benefit those who are keen to learn more about Sarawak Laksa and for those who are overseas, as all these spices are mostly imported from Middle Eastern countries, you can start making the paste using the powder form purchased from Indian stores. In that case, you will not worry about the kitchen equipment required, how to cook and grind the raw materials, it will at least cut short half of your time. I believed that this is also what our manufacturers in Sarawak is doing. This is a long post that dealt with lots of research, reading and testing. If you found that it is useful, please forward to your friends. I will be most happy to answer any queries they have. Any factual findings that are not accurate, please drop me a line to let me know. 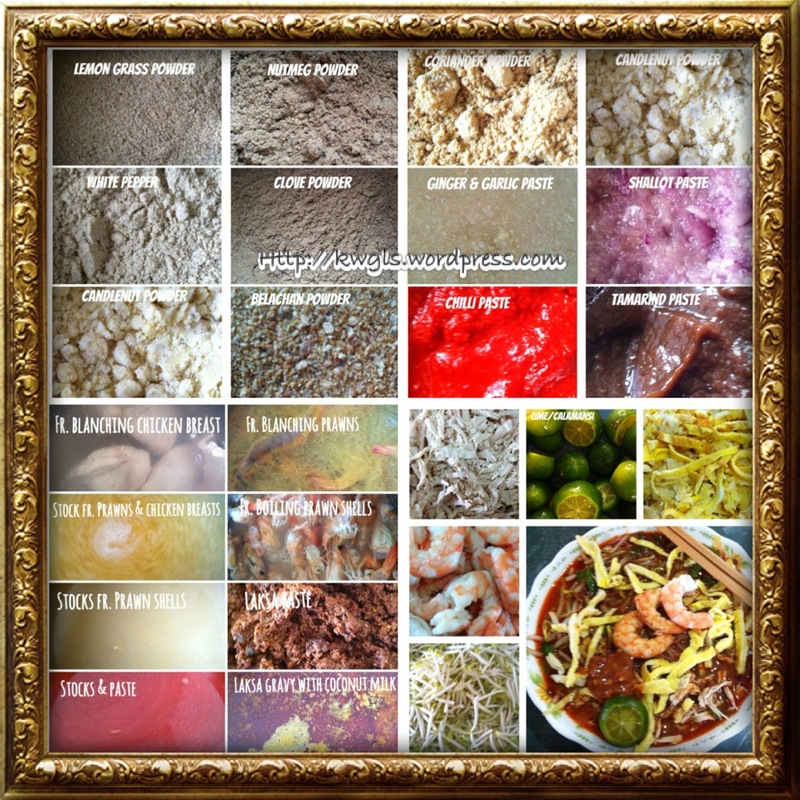 This entry was posted in Food Preparation Series, Noodles, Rice and Others and tagged 10, 8, CHINESE, GUAI SHU SHU, Guaishushu, HERBS, kenneth goh, laksa paste, LAKSA PASTE RECIPE, malaysia, postaday, sarawak, Sarawak laksa, singapore, SPICES. Bookmark the permalink. like yr sharing…very detail, step by step ..I like it very much! but I’ve yet to find one laksa paste that is just like the real thing. This one that I used thsi time around was pretty good too though.